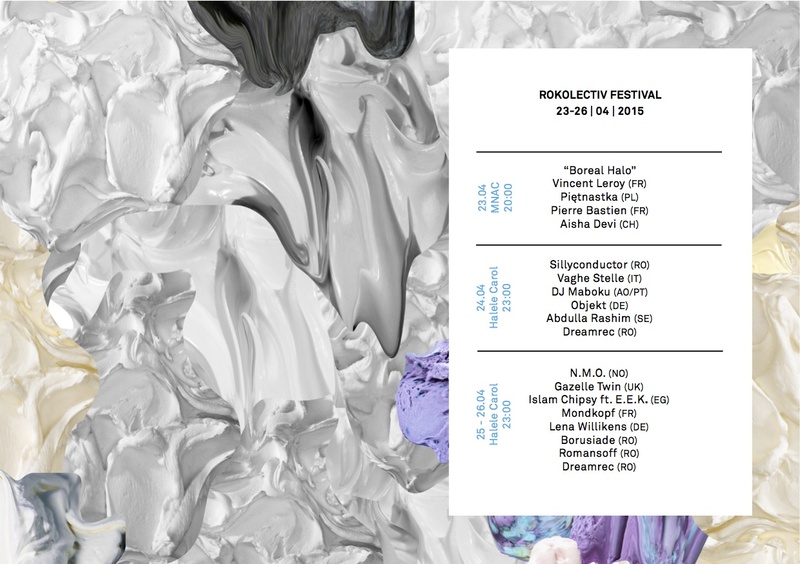 Rokolectiv Festival celebrates its 10th anniversary with 4 days of performances, installations, screenings and educational events taking place at the Museum of Contemporary Art and, starting this year, at Halele Carol, an industrial heritage building turned into arts venue. It’s been an adventurous, strenuous, yet highly entertaining journey, with over 250 legendary and upcoming artists shaping the trends in sound, music, and related visual arts invited to perform in Bucharest over the years. This year’s Opening Night symbolically remains at MNAC, in the throbbing rhythm of an aurora borealis, with the superb installation of French artist Vincent Leroy, Boreal Halo, standing as a metaphor for our efforts to slow down time and decompose movements. The night will continue with live performances featuring Pietnaska’s densely-woven sound-tapestry with synthesizer and drums, enigmatic Aisha Devi’s abstract yet visceral techno structures, as well as a come back of brilliant French composer Pierre Bastien and his surreal mechanical sound factory. More than ever, the line up welcomes the rise of several key female musicians relentlessly crafting their way in a scene dominated by male figures. With her last album declared “album of the year” by The Quietus, Elizabeth Bernholz with her duo project Gazelle Twin is among the most promising female names, one that causes deep mutations to the notion of “pop”. The two golden girls of Cómeme, “veteran” Lena Willikens and freshly signed Borusiade will also spread some further free spirited ♀talent♀ on the dancefloor. The 10th anniversary also celebrates the proliferation of non-Western influences in electronic music, with outstanding musicians freeing the sounds of the peripheries beyond their geographical barriers, and dropping them hot and contemporary in the so-called “centers”. Hailing from the Imbaba neighborhood of Cairo, hyper-speed keyboard virtuoso Islam Chipsy and his powerhouse drummers E.E.K. perform an explosive and psychedelic experience of Arabic melodies. From Angola via Portugal comes DJ Maboku, one of the youngest in the crew of brilliant Principe Discos label, who smartly integrates kuduro, batida, and kizomba into the more familiar club genres like tribal house and grime. And, though more rooted in the European context, expect some further incursions into Arabic instruments with Sillyconductor’s Oriental take on Pianosaurus, as well as Nigerian, Indonesian or Javanese sounds in Pierre Bastien’s one-man orchestra, and some Tibetan heritage coming out through Aisha Devi’s throat-singing mantras. But while we’re still on this continent, the European dimension will also be well represented by some adventurous musicians, with Norwegian duo NMO’s “military space music”, Berliner Objekt’s bassy, half-step atmospheric techno, as well as dark techno wunderkinder Abdulla Rashim and Mondkopf. A living proof that old Europe can still challenge and renew its electronic music stratosphere. Speaking of which, we are happy to announce Rokolectiv Festival is, starting this year, also part of SHAPE, a new initiative co-funded by the Creative Europe programme of the EU and put together by 16 festivals & art centers willing to support upcoming musicians. Aisha Devi, Mondkopf, Sillyconductor and Borusiade are just four of the names in this year’s pool, with further announcements to be made for autumn. As always, don’t forget to check our Specials sections, with a kinetic installation developed by Sergiu Doroftei as a result of a collective workshop with art students, screenings of videos (Ryan Trecartin, Vlad Nanca, Ivana Mladenovic), documentary films (“Electro Chaabi”), and a presentation of journalist Paul Breazu taking an incursion into the 90s “Albatros” generation.